Spectacular flowers and bright, dazzling leaves for year-round colour. New and exciting variegated foliage. A NEW and exciting Rhododendron, 'Molten Gold' is a variegated Rhodo with purple flowers in late May. Probably the best variegated rhododendron available, it has stunning leaves, with a bold yellow splash through the centre. Unlike other varieties with similar markings, Molten Gold has much more stable colouring, rarely reverting to green. Just imagine the vibrancy that you can bring to your border with this fabulous plant - it's evergreen, so even when not in flower it will brighten even the dullest shady border all year round! Your rhododendron should be planted slightly higher than it was in its pot into well-draining soil. Rhododendrons need an acidic soil with a pH of around 5.5 in order to thrive - soils with pH higher than 5.5 should be acidified before planting or you can grow 'Molten Gold' in a container with ericaceous compost - where it will look fabulous! Supplied as an established plant in a 2L pot, ultimate height 125-150cm in 10 years. Your rhododendron should be planted slightly higher than it was in its pot into well-draining soil. 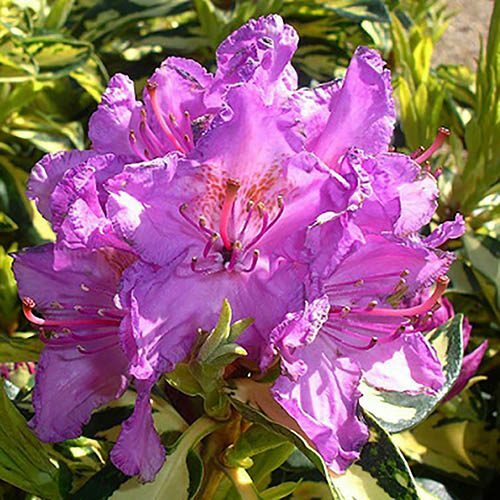 Rhododendrons need an acidic soil with a pH of around 5.5 in order to thrive - soils with pH higher than 5.5 should be acidified before planting or you can grow them in a container with ericaceous compost. Pruning your Rhododendron is simple, just remove any dead wood and faded flowers. Growth can be limited by pruning out crowded shoots and any branches that have become too long. Mulch and feed after pruning. You may prune out crowded shoots and diseased or damaged shoots in order to contain and limit the growth of the shrub if it is necessary.